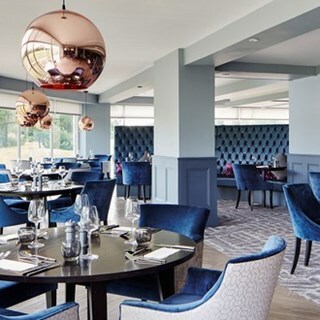 The Fairway Grill is smart, modern and finished with luxurious soft touches that make for an intimate atmosphere, which is perfectly complimented by our friendly and attentive service; with fabulous views overlooking the golf course, fine dining at Formby Hall is a truly wonderful experience. Had a lovely time. Food and staff lovely. The package purchased was too expensive to what we received. We were forced to book the evening meal too late at 20:30 and could not change it. We arrived few minutes early (20:26 to be precise) and were told we are not allowed in restaurant till 20:30 and we should buy a drink in the meantime, yet there were a lot of empty tables. We were not invited in after 20:30 until we went to ask again. Service took ages to bring the drink and we did not receive our food till after 21:30 to be given an alternative side order as restaurant ran out. The service was very slow. We were at the restaurant for 3 hours which is very long. We were disappointed. Very slow service - restaurant busy and staff were trying their best. Charged £7.00for 2 bottles of water which was excessive and should of been given option of tap water -  won't fall for that again. One of our group had the pork dish, which was extremely dry and potatoes/veg served with it were poor - she left dish and ended up eating chips off our fish & chips as she was hungry. Not great! Food was fabulous. Lovely staff they were very friendly and welcoming. I stayed with my friends and family to celebrate my birthday. We pre-booked our food, the choice was excellent from the set menu and the al a carte menu with slight supplements. We had cocktails in the bar prior to the meal and was served by a lovely young lady called Elizabeth, friendly, helpful and table service. The meal was delicious. Everyone agreed how lovely the food was, tasty, well presented and generous portion sizes. Our waitress was friendly and attentive and looked after us extremely well during the meal. Breakfast the next day was amazing. so much choice and plenty of it. The staff are helpful and the tables are cleared away quickly and its spotless. such a lovely view of the golf course too. Couldnt fault the service at all. Lovely homemade food. Presentation is excellent and the homemade hand cut chips were fabulous! Drink variety was very good and cocktails were very tasty! Every member of staff we encountered were friendly, helpful and very amenable. Room was lovely, look forward to our next visit. Soup of the day was delicious, not happy with the choice of mains on the 'two course pre set menu'. Gave server our cocktail vouchers but when I asked for the bill, I'd been charged for the cocktails. Despite all this the venue is lovely. Stayed over at the Hotel so we had a fantastic evening meal, starters, mains and dessert all cooked perfectly and tasted amazing! Then had Afternoon Tea the following day, again this was beautifully presented, our waiter was really helpful explaining all the sandwiches and cakes and it all tasted amazing! Will definitely be back again soon. Thank you! Excellent service,,food and drink, l felt thoroughly treated ,waiter service was impeccable. Slow service. Friendly staff but they kept forgetting our requests and we had to keep chasing them to bring things. Waited over half n hour to be served, drinks took a further 20 minutes, one drink didn’t even turn up at the table. One meal didn’t come as the waiter didn’t write it down, he also wrote for the steak to be medium rare when it was asked that it was medium - well. That meant two of us eating on our own at separate times to each other. Reception informed us Rob from the bar would be over as there was a mix up with drinks on arrival however he did not come over. We spoke to Chelsea, she was apologetic and tried to make or experience better however it was to late. One of our guests is pregnant and due to the waiting time and her just waiting for a glass of water, this made her become uncomfortable to the point she drove herself home after 11pm (she was booked to stay). Our whole experience was horrendous. Very disappointed...we had this spa day as a gift for Mrs Glover...that's Glover even though at least 7 times we informed  site that's her name they referred to us as gulliver... or something like that....the my wife broke her arm....disappointed  in the way we were treated to rebooked they gave a timescale that a broken wrist could not be healed for to enjoy her gift .but no movement from site...then on arriving  no apology but a few sweeteners...but spa and pool and gym...of no use to her with a broken wrist also we had to pay £25 to move the booking....which site said they will be getting back to us over that issue....we are still awaiting the sites response....totally disappointed.